Are you suffering from terminal moraine? As glaciers make their slow but massive progress across the landscape, the rocks and trees they shovel up as they go get stuck at the front of the glacier. They must slow it down a bit, make it scruffier, heavier, less clear headed. 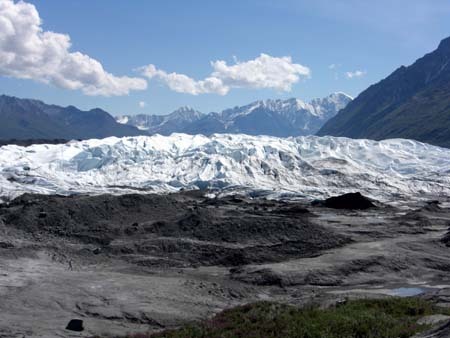 This debris is called terminal moraine and shows the maximum extent of the glacier even after recedes. It strikes me today that we do the same ourselves. So much of our life is about accumulation. We gather memories, friends, wounds, regrets. It is so easy to keep dragging it along with us and only free ourselves of it when we melt away. I like the phrase terminal moraine. It has a woefulness about it that clarifies the burden of this debris. Now I have noticed this in myself I am going to try to reduce it. Not by ceasing to progress, that would be a tragic avoidance of risk. But I will start by picking through what I have already gathered and seeing what can be put aside, converted to lateral moraine at the side of the glacier. Maybe some of it isn’t even a burden, but gathered treasure that can be honoured as such. We have huge things to do in our lifetimes. Each and every one of us. Even if it you don’t feel quite like a glacier, the impact of your life is significant and we owe it to ourselves and to the landscape to free ourselves to progress. So what’s in your terminal moraine that you could usefully leave behind?